Fender Mustang Model Electric Bass Guitar (1978), made in Fullerton, California, serial # S814136, natural polyester finish, ash body, maple neck with rosewood fingerboard, black gig bag case. Originally introduced in 1966, the Mustang Bass was Leo Fender's last original design for the company that bore his name. 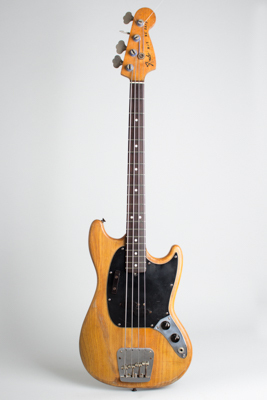 Although intended as a student model, the easy handling short scale bass has been used by many professionals over the decades since and endured as a classic in its own right. This one is from the late '70s -- the twilight of the original model -- and has obviously seen an epic amount of use over the last four decades. Overall length is 42 in. (106.7 cm. ), 12 1/2 in. (31.8 cm.) wide at lower bout, and 1 1/2 in. (3.8 cm.) in depth, measured at side of rim. Scale length is 30 in. (762 mm.). Width of nut is 1 5/8 in. (41 mm.). This four-string Mustang is a real road warrior. You want relic? Here's a combat veteran of the last four decades, probably with a serious punk-rock pedigree from the looks of it. The original heavy polyester finish is still on the body, checked, partially sanded down with areas missing (mostly on the edges), and darkened over the years. There are scratches and dents everywhere. The neck has been non-professionally refinished in varnish, and it actually feels better than the original heavy poly. It plays fine but looks pretty rough, especially the headstock where some of the original decals (luckily including the serial number) survive. (It's now logo'd a MUS-'NG BASS). The bridge (without the mutes), pickups, and all hardware have survived intact; the wiring rig looks newer. It has been refretted with larger wire, and through all this plays great and sounds as it should. This is obviously not a collector's choice, but if you want a compact, easy-handling bass that can really deliver in the most dangerous gigging situations, look no further. Very Good Condition.